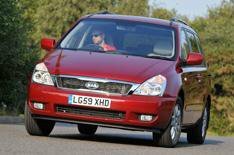 Kia Sedona: driven | What Car? Simplify or die. Kia has taken that maxim to heart with its Sedona MPV. It has trimmed down its engine options to a single 2.2-litre diesel and simplified its trim names to 1, 2 and 3. A face-lift has been mostly limited to incorporating Kia's new-look grille. The new 2.2-litre diesel is more economical than the 2.9-litre engine it replaces, yet with 192bhp it has an extra 6bhp. With all that power, the Sedona is a fine motorway cruiser and surprisingly quiet. Around town, it's a different story: the car feels big and floaty, but if you go over big bumps you really feel the suspension thudding, so it's not as composed as a Ford Galaxy, for example. The new six-speed auto gearbox can't quite make up its mind which gear it should be in at low speeds and it harms fuel economy and emissions, too the auto sits four tax bands higher than the manual. The upright seating position is good, and there's a grand view out, although the parking-sensor screen incorporated into the rear-view mirror takes getting used to. There's loads of space in the front two rows and plenty of cubbyholes and cupholders throughout the cabin. Seats in the second and third rows can move back and forward, but ultimate practicality is limited by the fact they seats don't fold flat into the floor. You can take them out, but they are heavy. Sure, that new engine is better than the one it replaces and the sliding doors are a real plus, but there are other MPVs that are better to drive, more practical and, although not as powerful, cheaper.